I hated apricots for almost five years. I hated them like I now hate pistachios, like I once detested puddings, like I will always despise mint flavored chocolate. Apricots were, and still are sometimes, deceiving and unpredictable. Apricots were rare, fleeting and dear one year, overwhelming, turned down and abundant the next; 70 pounds abundant, to be exact. And even with quite a big kitchen, they were crowding our space and our heart sitting by the wicker bread pin. Of course we were delighted when we first received this sweet treasure. We polished it, smelled it and ate it at breakfast, lunch and dinner. We shared them with neighbors. We painted the pits, kept them in our pockets and invented games. My mother and I made apricots jam, apricots tarts, galettes, cakes, fruits salads and clafoutis. We were happy, although busy nearly every afternoon, worried about rotten apricots every night and growing tired of them every morning. Until summer 2003: 20 pounds of apricot jam in our kitchen, snug jeans and one bottle of Pepto Bismol. I was done with apricots. It took me five years to make peace with apricots again. But not any apricots: ripe, sun kissed, rose blushed apricots that were winking at me last Saturday at the farmer’s market. 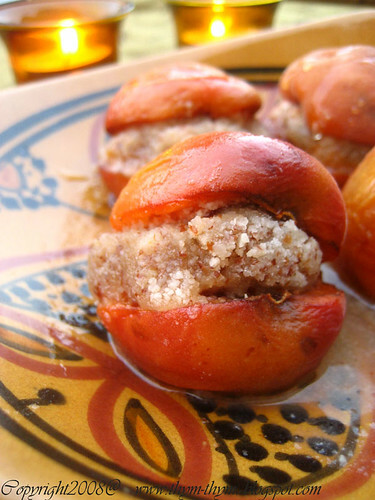 They were so beautiful, so sweet and meaty that I had to make the ultimate, dead easy, lazy friendly dessert that is Baked apricots with almond paste. Almond paste based desserts are a staple in our kitchen and in many Mediterranean kitchens. While different recipes and varieties exist, the one that we use in North Africa is basically ground almond to which we add sugar and orange blossom water, or rose water, until we obtain a smooth paste. You halve the apricots, fill them with the almond paste and bake them until they start to soften slightly. That’s all. 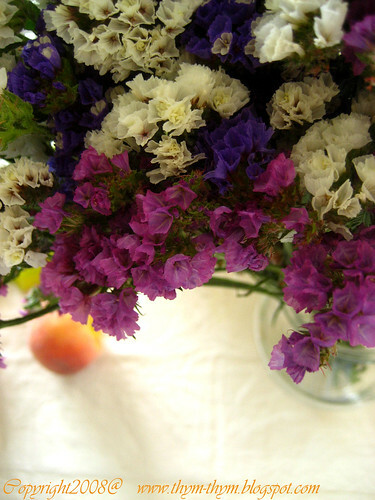 It is tart, sweet and wonderfully scented. Along with a scoop of ice cream, a cloud of crème Anglaise or Zabaglione, and I might even reconsider eating mint flavored chocolate again. Or may be not! Preheat the oven at 350F. Butter a baking dish and set aside. Halve and pit the apricots. Mix the ground almonds with some sugar, depending on the sweetness of the apricots. Taste the almonds and sugar mixture as you mix to see if you need to add more sugar or not. Start by adding 1 tbsp of orange blossom water to the almonds mixture and add more if necessary until you have a smooth paste. Fill each apricot half with the almond filling and cover with the other apricot half. Continue with the remaining apricots. Put them in your prepared pan and bake them for 10-15 minutes, or until the apricots start to soften slightly. 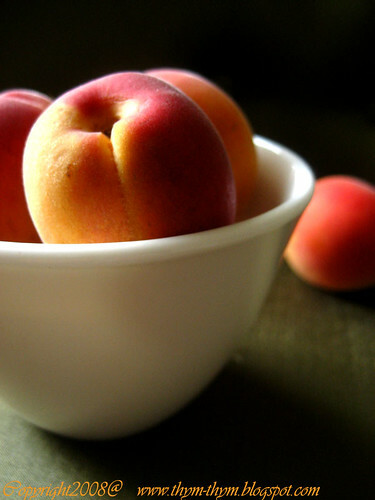 Keep an eye on the apricots after 10 minutes, as you don’t want them to fall apart. Serve warm as it is, or with a scoop of vanilla ice cream. The latter choice happens to be my favorite. Note: This dessert should be consumed on the same day, as they become mushy once in the fridge. You can find orange blossom water at Middle Eastern stores. Préchauffer le four à 180C. Beurrer un plat allant au four et mettre de côté. Couper les abricots en deux. Mélanger les amandes hachées avec un peu de sucre. La quantité du sucre depends de la douceur des abricots. Gouter au fur et à mesure le mélange d’amandes pour voir si il vous faut rajouter du sucre. Commencer par verser une c.s d’eau de fleur d’oranger sur le mélange d’amandes, et rajouter si necessaire jusqu’à obtenir une pâte homogene et souple. Fourrer chaque moitié d’abricots de la pate d’amandes et couvrir de l’autre moitié du fruit. Continuer jusqu’a épuisement des fruits. Arranger-les dans votre plat préalablement beurré et faire cuire 10-15 minutes, ou jusqu’à ce que les abricots soient tendres. Garder un oeil sur les abricots après 10 minutes de cuisson, car vous ne voulez pas que les fruits s’effritent. Servir tiede, seuls ou avec une boule de glace à la vanille. La derniere proposition est celle que je préfere. SImply gorgeous! These really look delicious and a great way to enjoy such lovely fruit! It took me some time as well, to come around to liking apricots :0) That dessert is gorgeous!! As are the flowers. Hmmm.... I just happen to have apricots that need to be used. Also, Warda, there is orange blossom water at Plum and at Kitchen Port (possibly other places, too, I just know I've seen it in those stores). I've never been a big fan of apricots but the almond filling makes these very appealing. Superbes photos et superbe recette mais c'est une habitude chez toi... et tu arrives même à me donner envie de te lire en anglais... pffff ça c'est pas gagné par contre ,-) ! Apricot season is long gone over here, but I'll look for some peaches tomorrow morning- to celebrate the birthday of a nostalgic uncle, and use up some leftover almond paste that is sitting in the fridge. Merci! About flower water- I broke a new bottle a few weeks ago; I managed to salvage about half the water, but the best part was that I got to mop the floor with the rest... We had the best smelling kitchen in the middle east! You'd have loved it. Beautiful! I have an abundance of peaches at the moment, a gift from a friend's tree. (Why do all of the peaches come at once???) I'm going to try this with the peaches; I'm sure it will be delicious. - Marion, I am sure yours was 10 times better than mine, as the combination sounds so intriguing! How do you come up with such ideas? I am so obsolete! - Veggiegirl, thanks a lot! Apricots tend to be desapoiting, especially when not ripe. - Jen, Sarah, from unabuenafurschetta, told me the same. I like to buy mine from Middle Eastern because they carry my favorite brand, Cortas, and it is cheaper. What else can I ask for? - Maggie, although not my favorite fruit, I like it with the almond paste ten times better. - Patti, thank you, my friend! - Y, of course I would have loved it!you shouldn't have told me that story. Now my hands are itching to pour some in my kitchen...and all over my house. Peaches would work beautifully as well. Send my warm wishes to your uncle for me. - Lydia, what great friends you have. I will never complain about having too much peaches at once, especially if they are sweet and juicy. as I always tell Z taste buds change over time so it is always good to try things you think you don;t like from time to time but I am with you when it comes to mint flavored chocolate. by the way Z has found a lot of things she loves that she once thought she hated. Oh, darling! I'm glad to hear you changed your mind about apricots - and this is such a simple yet wonderful dessert! They look absolutely amazing! I'm sure they tasted even more wonderful! Beautiful, simple way to make a stunning dessert. Really great idea. I also love the perspective on that last photo! I love this simple recipe ! Luckily for me I love apricots, these look delicious!